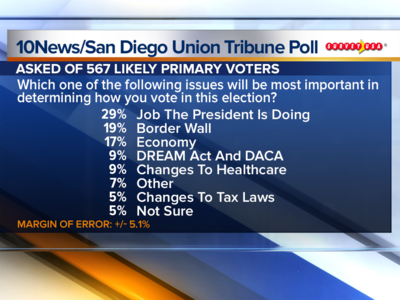 SAN DIEGO (KGTV) - Incumbent 50th Congressional District Rep. Duncan Hunter is almost assured to be one of the candidates that will advance to a November runoff, but it remains unknown who will be there to challenge him later this year. 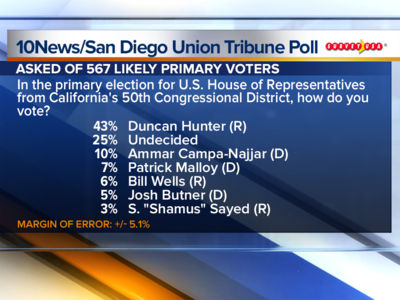 According to a scientific 10News/San Diego Union-Tribune poll , the Republican Hunter leads his nearest challenger, Democrat Ammar Campa-Najjar, by a fairly large margin -- 43 percent to 10 percent -- heading into the June 5 primary election. The poll shows 25 percent are still undecided. The two top vote-getters will advance to the November runoff, even if Hunter were to receive over 50 percent of the vote in the June 5 primary. "This is good news in a bad year for Duncan Hunter. It takes an opponent to beat you and right now, no opponent has gathered the support to be that tough challenger," said Thad Kousser, political science professor at UCSD. 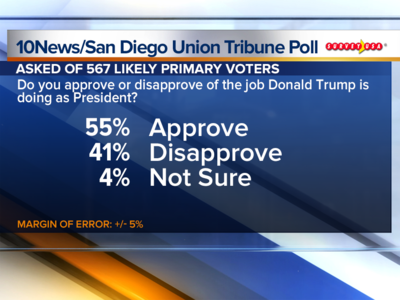 The poll conducted by SurveyUSA also shows 55 percent of voters in the 50th District approve of the job President Trump is doing. Additionally, 40 percent of 50th District voters said the current FBI investigation into Hunter’s alleged misuse of campaign funds won’t influence how they will vote. 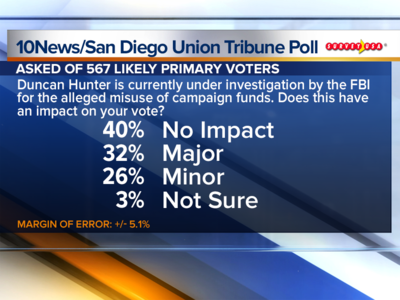 However, 32 percent surveyed said the Hunter probe will have a major impact on how they vote. "Everyone is waiting to see if there's another shoe will drop. I think this poll shows if there is more bad news, voters are willing to entertain it. If nothing happens, he's the leader by far," said Kousser. Which one of the following issues will be most important in determining how you vote in this election? Do you approve or disapprove of the job Duncan Hunter is doing as U.S. Representative? Duncan Hunter is currently under investigation by the FBI for the alleged misuse of campaign funds. Does this have a major impact on your vote? A minor impact on your vote? Or does it not impact your vote at all?